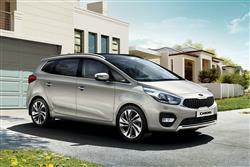 Find out everything you need to know on the new Kia Carens from independent vehicle review website Car And Driving. You can watch the video review to the left to see more of the car or read their written review below to get a true insight from an expert in the automotive industry. Kia's improved third generation Carens is the South Korean maker's most serious stab yet at the People Carrying market. Jonathan Crouch checks it out. With smart looks, a practical interior, great build quality and solid engineering, Kia's improved third generation Carens is a 7-seat compact MPV is well worth your attention. Especially now that it's been enhanced with smarter looks, greater efficiency and improved media connectivity. Though well appointed, it offers strong value and efficient running costs. In other words, you get pretty much everything families are looking for in this segment. Look at what most growing families actually need and this is it: a compactly-proportioned 7-seat MPV. Look though, at what most growing families actually want and a people carrier of this kind with a Kia badge on the bonnet has rarely been top of their shopping lists. If this South Korean maker is to continue its ambitious rise in sales, it's time for that to change - with this car, the third generation Carens. This third generation Carens needed to offer a big step forward, with desirable styling, impressive quality and hi-tech engineware. It needed to be practical too, given that the deletion of the big Sedona MPV from Kia's model line-up meant that going forward, this would be the only family-sized people carrier the brand would offer. Hence the fact that for the first time, this car is being offered only with 7-seats. So can it deliver? Let's find out. On the road, you get a firm set-up that deliberately distances this Kia from softer-sprung but more roll-sensitive rivals like Citroen's Grand C4 Picasso and Renault's Grand Scenic. Not that you should get me wrong here: if you're running late for the school play and throw the thing hard into a bend, you'll get plenty more bodyroll than you would in, say a rival Ford Grand C-MAX. But in normal day-to-day motoring, most families should be quite happy with the ride and handling compromise that's been reached here. There's also the standard inclusion of Kia's Flex Steer system so you can alter the weight of the steering. Under the bonnet, buyers get to choose between a 133bhp 1.6-litre GDi petrol unit or a 1.7-litre CRDi turbodiesel, offered in 114 or 134bhp states of tune, the latter available with the option of a 6-speed auto gearbox. Most will be choosing between the GDi petrol unit or the lower-powered diesel, both capable of around 112mph flat out. On paper, the diesel gets there in a more leisurely fashion, the 0-62mph sprint taking 12.6s as opposed to 10.9s but in practice, the CRDi model's greater reserves of torque (there's 95Nm more of it) make it feel a more willing companion. As ever, Carens buyers only get one body size: unlike Ford, Citroen and Renault, Kia doesn't see the need to offer separate five and seven-seat bodyshapes in this segment. It never did previously either, but older Carens models offered the choice of either five or seven seats. Here, you've a seven-seat-only design. But a better looking one in this revised guise. Updates include revised front and rear bumpers, smarter front fog lamps and an updated 'tiger-nose' grille, plus there are revised rear lamps too. On to practicalities. It's one thing cramming three rows of seating into a car as relatively compact as this one (the 4.5m length isn't much greater than that of a Focus hatchback). Quite another for the rearmost pews to be actually properly usable. Are they here? Well, I don't want to get your hopes up too high on this score. No compact MPV in this class has yet delivered third row seating that's properly comfortable for adults on long journeys - and this one doesn't either. But, seating at the very back is fine for kids and at least here easy to access thanks to an effective middle row tilting and sliding mechanism. As for that middle row, well it has three separate chairs that recline and slide. Luggage space is restricted to just 103-litres with all seats in place, but rises to 492-litres with the third row flattened and 1,560-litres with the second row flat too. Up-front, you view a clearly presented set of instruments through a smart, leather-trimmed three spoke steering wheel with intuitive controls and faultless functionality that leaves everything exactly where you'd expect to find it. A clever colour touchscreen, 7 or 8-inches in size, dominates the dash and there's better quality seat upholstery in this revised model, as well as smarter metallic and gloss-black accents throughout the cabin and a classy carbon-effect fascia trim. The days are past when Kia sought to dramatically undercut its mainstream rivals on price, but that doesn't mean its much improved products can't still offer decent value for money. In contrast to earlier versions of this car, this one continues to come only with seven seats, priced in the £18,500 to £28,000 bracket - which on the face of things you might expect would be typical of the budget required for compact seven MPVs in this segment. Most potential owners will want to find the £1,400 budget required to go from the entry-level 1.6-litre GDi petrol variant to the lower-powered of the two 1.7-litre CRDi diesels. There'll be far fewer takers for the higher-powered 1.7-litre CRDi variant which is much pricier as it comes either in mid-spec automatic form or as a top-spec manual. The key equipment change on this revised model relates to the 7.0 or 8.0-inch centre-dash touchscreen that can feature not only navigation but also Kia Connected Services powered by TomTom, plus a rear-view parking camera. This touchscreen system also incorporates the 'Apple CarPlay' and 'Android Auto' systems for full smartphone integration. There's also now an optional JBL Premium Sound system, which features a subwoofer, external amplifier and six speakers for greater audio quality throughout the cabin. Across the range, you can expect to find features like LED daytime running lamps, cornering lights that illuminate your way around the bends, auto headlamps that stay on to see you to your front door at night, power mirrors, tinted glass, air conditioning with proper rear air ventilation, a cooled glovebox and a useful 'rear conversation mirror' that helps you keep an eye on the kids as you drive. Kia hasn't been able to get around to updating its diesel engine range but it has engineered an 'Eco Pack' for the 114bhp 1.7-litre CRDi unit that most customers choose, this incorporating Michelin low rolling resistance tyres and a series of revised gear ratios. As a result, CO2 emissions can be reduced to 109g/km. All manual models get Kia's ISG Start/Stop on all manual models to cut the engine when you don't need it, say stuck in traffic or waiting at the lights. The electric power steering, sleeker shape and alternator management system as help efficiency. As a result, the 1.6-litre GDI petrol model manages 44.1mpg on the combined cycle and 149g/km of CO2. The diesels of course can do much better than that. Around 60mpg isn't out of the question on a reglar basis if you go for the most frugal 114bhp variant and even the minority interest 134bhp version of this engine manages 132g/km and 56.4mpg. You take a much bigger hit though, if you opt for this pokier diesel with an auto gearbox. Here, the figures fall to 46.3mpg and 159g/km. That's despite the provision of an active 'ECO' switch that, when activated, causes the transmission to upshift as early as possible and promotes a more economical driving style by delivering a softer accelerator response. Used values will be continue to be propped up by Kia's excellent 7 year/100,000 mile excellent warranty arrangement given that, unlike programmes such as Vauxhall's 'Lifetime' warranty, it's fully transferrable to second owners. The MK3 Carens model has proved to be a useful step forward for Kia in the compact 7-seat MPV market segment and this revised version usefully refreshes the Korean maker's offering in this sector. Buy one and you get the same strong build quality, reliability and long warranty you had before but now wrapped up in a more effective, desirable and efficient package. Yes, also a pricier one, but the value proposition still remains strong in comparison with obvious rivals. Strong enough to deliver what Kia craves with this MK3 model - conquest buyers? Perhaps. You certainly get a lot more for your money here than rivals from brands like Ford, Renault and Citroen can offer. For the money you'd give to these makers for a five-seat compact MPV, Kia provides a seven-seater design that's better equipped, just as efficient and, to some eyes at least, even arguably better looking. Overall, it's not hard to make a case for it.